After nearly 20 years of searching, my husband and I found a lake camp which met our criteria ... affordable, room for our immediate family to spend the night, on the sunny side of the lake, and great location. While a steep property (with lots of stairs) is a turn-off to many people, we love it! It means gorgeous views, sunsets, and deep water in which to swim. We closed on the property in November of 2013 and visited a few times throughout the winter. We were somewhat dismayed to find the aluminum dock, which has been hoisted out of the water for a couple of years while the property was vacant and for sale, damaged after a wind storm in April of this year. 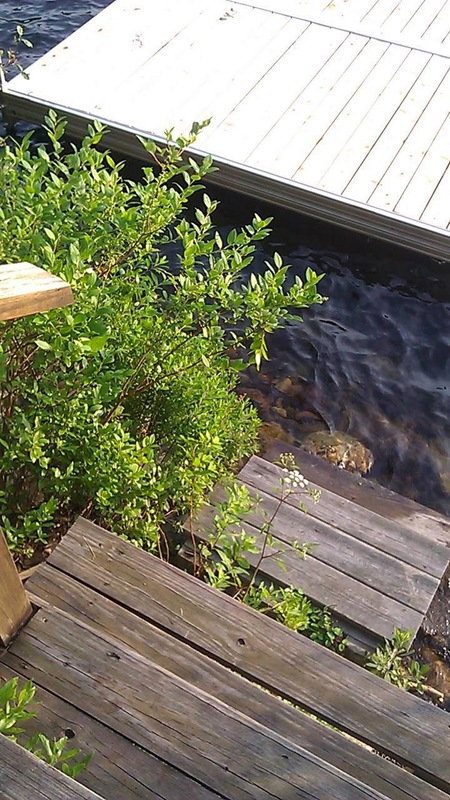 With it, the dock took the last few stairs down to the water. As luck would have it, a set of 3 steps washed up. It didn't match up with the remaining stairs ... you'd have to sit on your bottom on the last stair to reach the little set of steps, but it enabled us to get to the water until we figured out how to repair the stairs and tie them to our new dock. On Saturday, July 5, we went to the camp with the intention of taking the entire day off from our renovation projects. We'd be having at least one friend over for fireworks ... perhaps more. I decided to take two chairs down to the dock while my husband cleaned some additional chairs in the camp. As I descended the stairs, I knew I'd have to do something with the chairs as I sat to get to the lower steps, so I decided I'd put then off to the side of the stairs and get them once I was beneath them. I stopped on the last stair, turned to my left and attempted to put the chairs onto the ground around the hand rail. I was holding the chairs in my left hand and the railing with my right. The chairs started to fall, throwing me off balance, and my right hand was too low on the railing to counteract the force of my shifting weight. Yes, I had a flash of recognition that I was going to fall, but it wasn't enough in advance that I could prevent it, so I just let go. I let go of everything ... any fear of what lie in my path, any fear of where I might land ... I just fell through space, barely feeling myself hit the steps or anything else until I landed, feet underwater near shore and head about 4 feet underwater near the dock. I did feel my hand/wrist impact sharply on a rock. I quickly got myself up and out of the water quickly and climbed up the stairs to the camp. My husband, shocked to see me in shoes, jeans, shirt and jacket dripping wet from head to toe, sat me down and we assessed my condition. I was seriously shaken up, but only my wrist appeared to be injured. "Put my guardian angels to a big test last evening, and so grateful they succeeded. I fell sideways off a platform 7 vertical feet into 4' of water, headfirst. I bounced off a set of steps on the way. 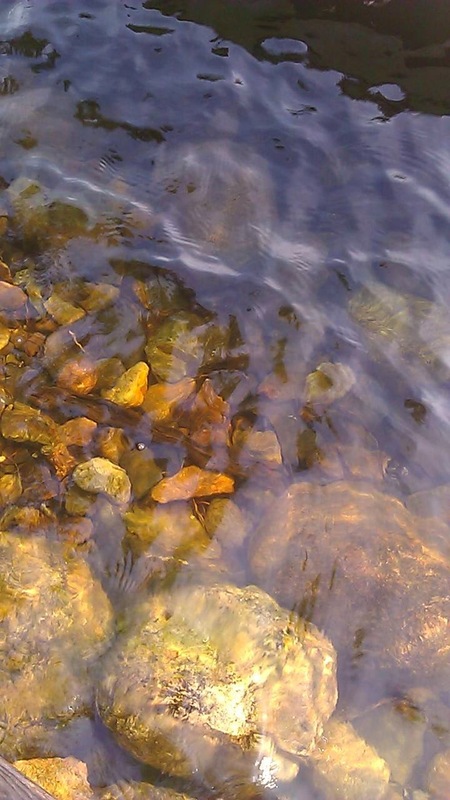 Water was filled with rocks and small boulders. I only impacted a rock with my right hand, and now know my head came very close to a boulder. I was alone at the time and can imagine a much different outcome had I been knocked out, as I was totally submerged. Large egg on wrist almost immediately. Iced and soothed it while watching wonderful fireworks and worked on it each time I awakened through the night. Egg gone on the middle of the night. Sore this morning, but incredibly better. Thanks and gratitude to all the unseen angelics who have the formidable task of keeping me safe and whole <3"
I know that no ONE being is more important nor more special than another. We are equal. Moreover, we are connected. We are connected our Source of life; we are connected with one another; we are connected with beings unseen. I experience this fully on may levels when I do group and individual healing session work with others. We are eternal beings living a human existence on this beautiful blue/green sphere called "Earth". Yet, this human body is fragile. Our bodies can be irrevocably damaged in a mere fraction of a second. Not only is your life precious, ALL life is precious. So here's the conundrum ... we are eternal beings, yet we have a very fragile vessel in this lifetime. Hence, our life is a balance of, among other dualities, immortality and mortality. In nearly every situation, we can choose a perspective of victimhood or one of gratitude. When we walk the path of gratitude in this Earthly life, which can be so fraught with trials and tribulations, it's easier to align with the ever-present path of faith ... trust ... assurance. And when we align with the ever-present path of faith ... trust ... assurance, it's easier to walk the path of gratitude. It's one of those proverbial chicken 'n egg situations. It gets us to that point at which we are able to trust that there's a higher order to life ... the place at which we know that when we free-fall God/Source/The Universe will be there to support us and our highest good!